Above: For more than 40 years Harry Stauffer roamed this region with his cameras, to document the fleeting images of our historic architecture and landscapes. He knew that future historians would want to see his photos, so he carefully created detailed labels for these photographs. 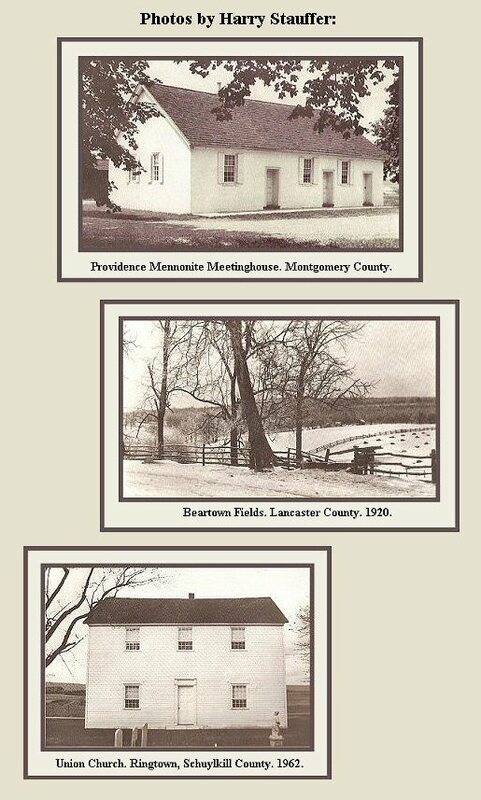 The photos are now archived at the Historical Society of the Cocalico Valley, in Ephrata, where Harry's print shop is also in storage. Harry and his camera were following in the footsteps of printer D. B. Landis, who one generation earlier has bicycled his way across Lancaster County with a camera, in search of the same images. 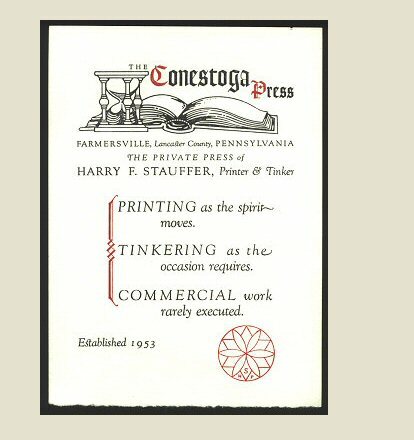 Above: 1953: Harry named his Conestoga Press for the nearby Conestoga Creek that meandered through the meadows near his Farmersville homestead. Meanwhile, in New York City, another Lancaster County printer, John Fass, was waxing nostalgic about another Lancaster County creek ...and named his private press The Hammer Creek Press, for a stream near his home in Lititz. We tend to romanticize our creeks (or cricks) around here. These guys both would have been familiar with the Riverside Press, where Bruce Rogers had displayed his brilliant sense of typography and design to become one of the greatest professional American book designers. P.S. The Lititz Run Creek flows through the lawn in front of my home and office. I am not a printer, but I do have one little Sigwalt printing press (I use it for a bookend), and a few fonts of type that I never use. Maybe some day I will print a business card here, and call myself "The Lititz Run Press," as a nod to those other creek-side bibliophile printers. Above: Harry's blackletter fonts in a blue border. That ornate initial "D" was designed by American typographer Frederic Goudy, and was released by ATF in 1919 as "Cloister Initials." Those initials are sometimes considered the most beatiful initials ever designed. You can download those initials Here. Also, Harry used "Goudy Text" for his primary font here. Goudy designed this font in 1928, based on a Gutenberg Bible font. You can download that font Here. Text: "You must not be double-hearted or you will have a miserable life: upright, firm and to God alone you must give your heart. 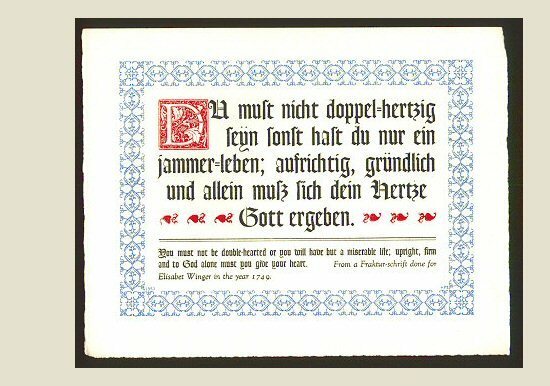 From a Fraktur-schrift done for Elisabet Winger in the year 1749." 1954: Harry's bi-lingual Chrismas card (broadside, actually). Harry and his family and his neighbors were bi-lingual. They spoke Pennsylvania Dutch (Pennsylvania German) and English. Harry's parents and ancestors were Mennonite, although Harry did not attend a Mennonite church as an adult. Above: Christmas 1966: The Letter L from the 1750 Ephrata ABC Book. In the 1960s, Harry also printed broadsides at the nearby Ephrata Cloister with the imprint "Restored Press of the Brotherhood / The Cloister." Three of those broadside are online, at the Library of Congress: Here, Here, and Here. 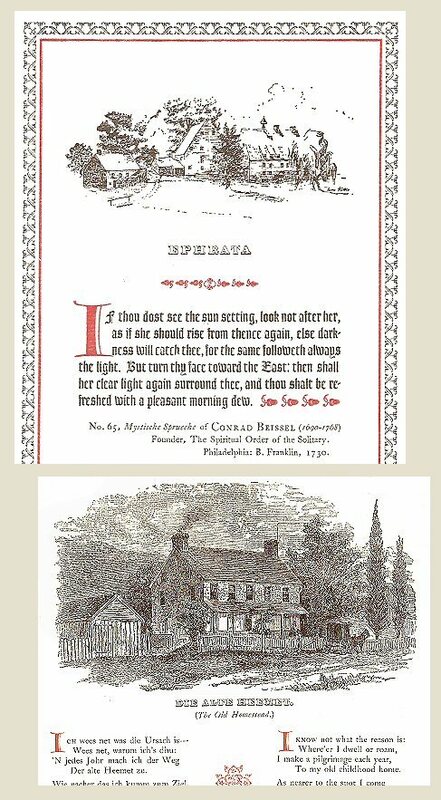 Above: Christmas Card with Poetry by Conrad Beissel, founder of the Ephrata Cloister. "If thou dost see the sun setting, look not after her, as if she should rise from thence again, else darkness will catch thee, for the same followeth always the light. But turn thy face toward the East: then shall her clear light again surround thee, and thou shalt be refreshed with a pleasant morning dew." 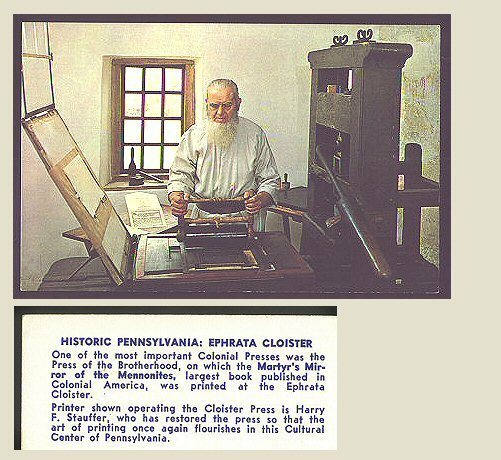 Above: A 1970s postcard: Harry Stauffer at the Ephrata Cloister with the Ouram Press previously used by Joseph Bauman. Harry was following in the footsteps of Ephrata printers Peter Miller and the Baumans. 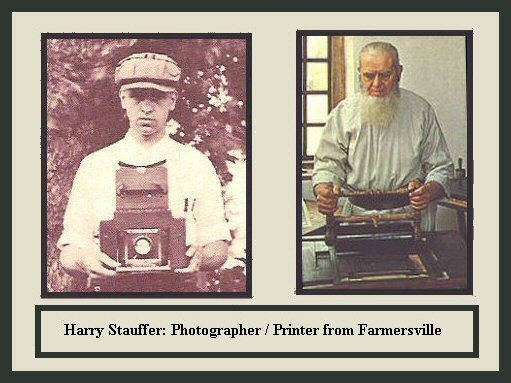 Harry was the last great Ephrata printer, until another one appears. Harry's printing press and shop are in storage at the Historical Society of the Cocalico Valley, waiting for someone to come along to keep the craft alive in Ephrata. 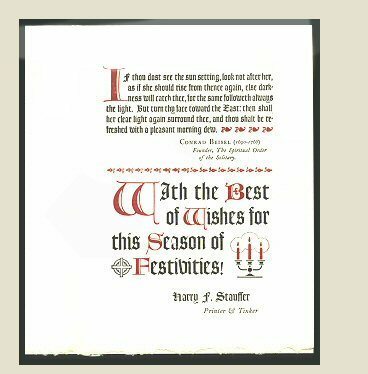 Above: Caslon font and Goudy ornaments on an iron hand press. Looks like William Caslon and Frederic Goudy were two of Harry's favorite typographers. Mine too. And I'm still trying to figure out who designed Harry's fraktur fonts. 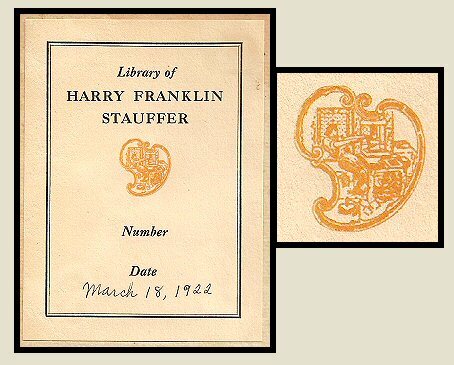 Above: Harry Stauffer's bookplate, dated 1922, when Harry was 26 years old. Harry was a passionate historian and bibliophile. This bookplate is in a book from his personal library. The book is The American Museum, printed in Lancaster in 1799 by brothers William and Robert Dickson, for Matthew Cary of Philadelphia. Harry was born on March 3, 1896. Above: For centuries European printers had created masterpieces of typography with the use of decorative ornaments, or fleurons. Lancaster's own Johann Albrecht followed in those footsteps, as did leading American typographers such as Bruce Rogers. Harry's favorite fleuron was a lopsided lily / tulip. 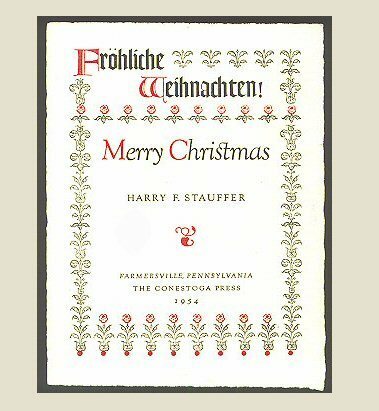 Harry was a great fan of the Ephrata Cloister fraktur lilies ...which are now icons of American folk art. Harry's Ephrata lily broadside is Here. 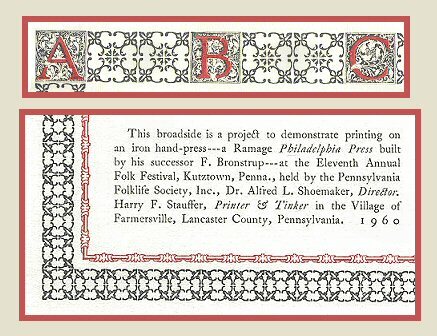 Above: Details of Harry's Poetry Broadsides: Harry Stauffer used his printing press to celebrate the Pennsylvania Dutch dialect, and its poetry. 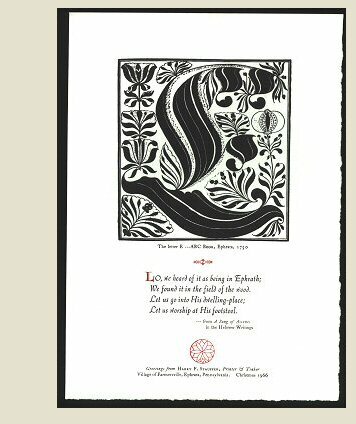 In the 1960s he created beautifully-designed poetry broadsides to show his friends and neighbors that their own rapidly-disappearing dialect was still worthy of the effort of hand-set printing. Harry selected the best poetry by the best Pennsylvania German poets for his broadsides, and explained to us why our poetry is important American literature. He explained that Emanuel Rondthaler's 1835 ballad is "the forerunner of a vast dialect literature." He explained that Henry Harbaugh's 1870s poetry is "...among the earliest literary productions of our local speech.". ...and "Happy are they who can read them in the original." Harry's broadside lyrics are mini-affirmations of self-identify and self-worth. They are celebrations of ethnic diversity and the American spirit.